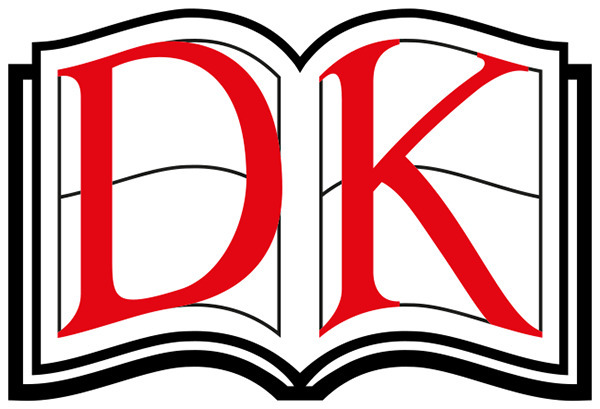 This updated DK classic includes sixteen colorful flashcards with tactile elements that are perfect for giving toddlers a head start in developing early language skills. Each 17-card pack contains 16 touch-and-feel picture cards and 1 card of parent guidance notes to help both parents and little ones get the most from the collection. 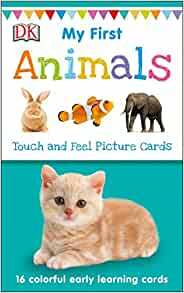 My First Touch and Feel Picture Cards: Animals features children's favorite animals, including puppies, kittens, rabbits, cows, turtles, horses, and more! 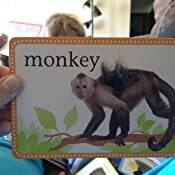 On the reverse of most cards, there are a series of engaging questions, in addition to word translations for Spanish, French, German, Chinese, and phonetic spellings to help develop early language skills. 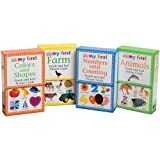 Sturdy cards and fun tactile images make these packs ideal for preschool play. 5.0 out of 5 starsHelped my non-verbal toddler!! My son is barely 2 years old and has speech delays. He can't even say 'mom' yet. That led me to order any sort of learning tools I could think of to help him before starting speech therapy. 5. The cards themselves are very thick, rigid and can withstand a good beating. I do daycare (and other children come to play) and have kids ages 6 months to 10 years spend lots of times using the cards. The older kids made games out of them including a weird version of 'go fish'. I've had a baby munch on the corner of a couple cards and they didn't get all soggy and tear because they're so thick. My rambunctious 2 year old hasn't managed to bend any of the cards yet, while our 'Baby Einstein discovery cards' are mostly bent so badly that you cannot see some of the pictures. My son now name 3 of the animals, can make the noises that most of them make, and can find a specific animal in the stack if I name one. That is amazing progress! The day after getting these cards, i ordered the 'first words' set by the same company, and while they are good, we definitely prefer the animals. I bought this card set for my non verbal 3 year old son. He currently is enrolled in the Early Childhood Special Education program. 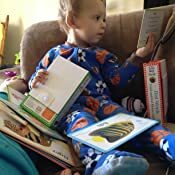 I'm constantly looking for activities that will grab his interest as well as assist him in the various areas he struggles in. This does that. Included in this purchase is 17 large cards (16 touch and feel, 1 card with suggestions on how to best use the cards). They all come in a sturdy storage case that can easily be tossed in a toy box or set on a book shelf. Please see included image. The images on the front of the cards are not illustrations, but are actual pictures of the items. On the backside of the card are suggestions for questions to engage your child, as well as spellings and pronunciations of the word in other languages. Please see included images for example. 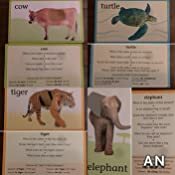 We use these cards to work on speech as well as animal identification. The cards are extremely sturdy and have endured a lot of abuse since we got them. Although the box it comes with is perfectly suitable for storing your cards, I keep them in a plastic container with a latch. This is so that I can store multiple sets all together. Included in this purchase is 17 large cards (16 touch and feel, 1 card with suggestions on how to best use the cards). They all come in a sturdy storage case that can easily be tossed in a toy box or set on a book shelf. Please see included images. We use these cards to work on speech as well as item identification. The cards are extremely sturdy and have endured a lot of abuse since we got them. WOW instant hit with my 15 month old. Immediately purchased 2 other versions. 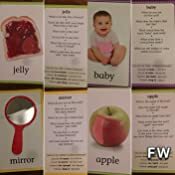 The cards are nice and sturdy, the colors are bright, and each card has a spot with a different texture or material for your toddler to feel (for example the jelly has a spot that's sticky, the corn has grooves and ridges). I love that on the back of each card they have ideas for the adult on how to help your child learn with the cards from suggestions of questions to ask when they are first starting out, working all the way to expanding on spelling related games as they get older, and even going as far as to include translations in Spanish, French, German, and Mandarin if you really want to be that over achiever. I love this because not only does this keep the cards relevant and engaging for your child as they get older, but it gives people with maybe less experience playing with younger children great ideas on how to use these cards. The cards fit nicely in their cardboard enclosure that is secured shut with Velcro, so they are easy to put away or take with you on trips. My only complaint would be that since this is the "First Words" version, I wish one or two of the items which are maybe not as common were replaced with items that would be more in line with actual toddlers first words...and really this is more nit picking than a complaint. 2.0 out of 5 starsSkip it. Not worth buying. Make your own. Meh, my expectations for this product were too high. First words include “sweater”. “Dog, cat, baby,” are ok but “sweater and mirror” just don’t seem like easy first words to include in the cards. Also, there are just 16 cards so those longer words just don’t seem to fit in the bunch. Not worth buying. 5.0 out of 5 starsEXCELLENT product for our non-verbal autistic son! These cards are WONDERFUL!! My son is now 4 and has autism and has not yet said a single word, but we have 4 different packs of these cards that he just loves and we use to teach him words. Even though he doesn't speak, we know he knows what things are because we can ask him to find a card of whatever it is and he'll pull it out and show us. We've owned these since he was diagnosed at 18 months and most of them have held up really really well! He also has sensory issues and loves how some of them are textured. For those of you who are church goers, these cards are something great to take to church because they come in a great velcro box and they're QUIET! Very pleased with these cards! Highly recommend!